Spring Break 2017 for SMU Outdoor Adventures started with a group of 10 participants which included two student leaders (Tanner Thompson and I) and the Outdoor Program Professional (Albert Mitugo). The rest were eager participants who had chosen to be in another place different from Cancun, Mexico. 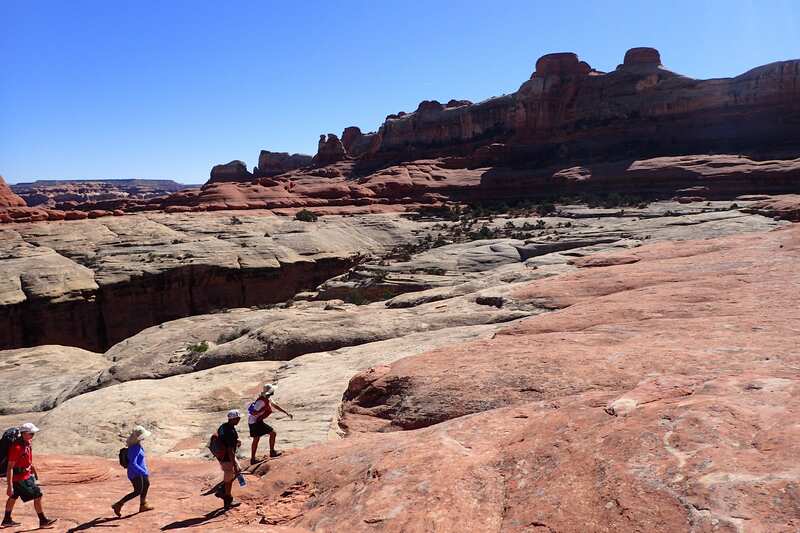 We had chosen to go to Canyonlands National in Utah, which is not exactly a stone throw away from Dallas. So we left SMU at the crack of dawn (4.30 am to be exact) on March 11 and drove 10 hours before we spent the night in Bernalillo, NM. The next day, we drove the rest of the way and camped at The Needles Outpost, just outside of the National Park. 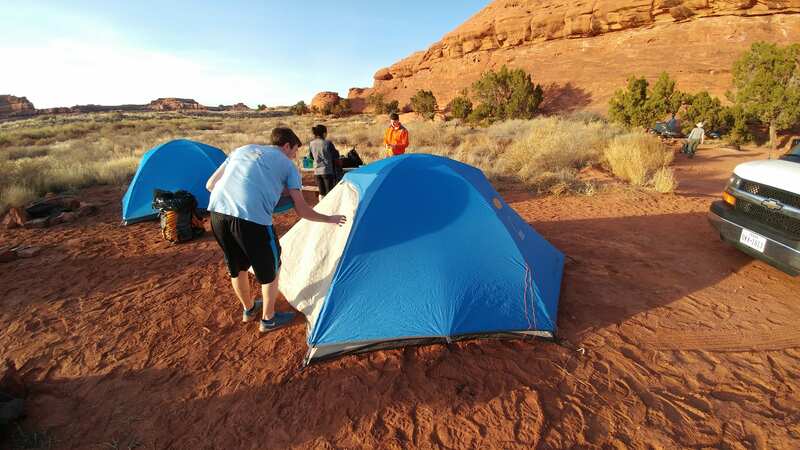 On the morning of March 13th, our group, led by Tanner and I (we were five in number because permits allow only up to seven individuals in a camp site) began the first leg of a 23 mile expedition in Canyonlands National Park. The other group of five was led by Albert on another route. As one of the group’s leaders, I was excited to put all of the work I spent planning this trip into action. We started in (relatively) unremarkable terrain, there were a few raised chunks of rock around us maybe 50 or 60 feet high, but other than that we were surrounded by scrub trees, cacti and bunch grasses. That quickly changed as we ascended from the trailhead, however. The soil under our feet soon turned into solid sandstone, and the small gulleys to either side soon became 200+ foot vertical cliff faces. After we had gained enough elevation, we were able to see the snowy La Sal Mountains in the distance towering over the desert canyons. The walls of these canyons seemed like they were made out of clay by a kid in kindergarten. Each rock feature was so exaggerated and bulbous, it seemed like I was looking at impressionist art. After about two hours of hiking we climbed the saddle into Elephant Canyon, which surprised me with its colors. Junipers and firs with dark green needles were contrasted by the deep oranges of the canyon walls. Add the clear blue sky into the picture and it seems like these colors were deliberately chosen for this place. Soon we were on the canyon floor in a dry riverbed, which made me feel tiny. It’s one thing to be on flat land with trees three or four times your size above you, but the walls of this canyon that engulfed us were easily 350 feet tall. They greatly restricted our visibility and dropped the temperature by at least 10 degrees (which was much needed, might I add). By this point we were within a mile of our campsite, so we took a quick snack break and kept on trudging through the sandy riverbed. We got to our campsite in about 45 minutes, exploded our packs, and got out everything we needed to make cheesy pasta, the perfect reward for a full day of hiking. 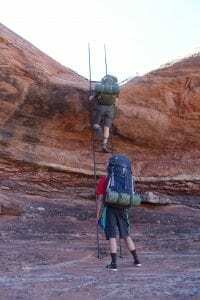 The next day, we had to climb out of Elephant Canyon and make the descent into Squaw Canyon. And I really do mean climb. When we got to the saddle between the two canyons, all we saw was a 20 foot rock face in front of us and a metal ladder made of rebar bolted into the rock. This ladder was built and maintained by the Park Service (whom I trust very much), but it was a scary climb nevertheless. My group made the climb up to what was at the time (and still is) the best view we had of the park. We were able to look down into both canyons and note the differing colors and geology, all with the snowy La Sal Mountains still towering over us from 50 miles away. 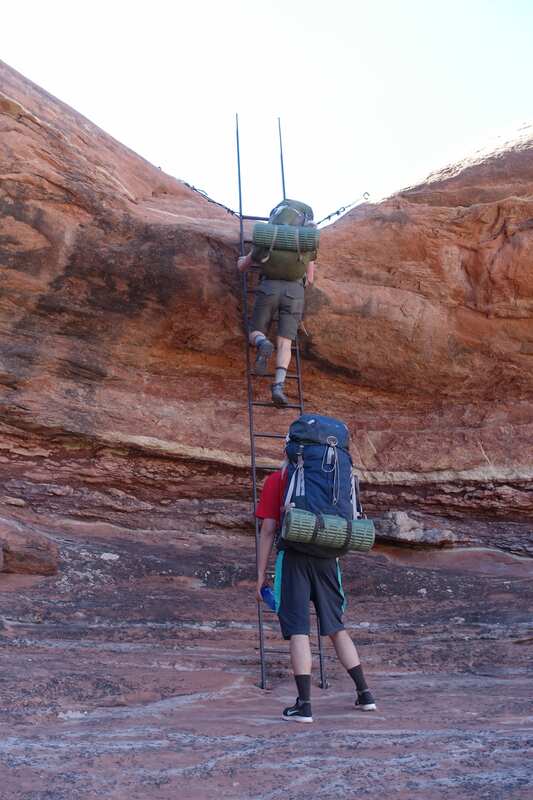 There was another ladder set up for us to descend into Squaw Canyon, and to be safe I set up a pulley system with the webbing and two carabiners I was carrying so we didn’t have to climb down with our packs on. The rest of the day was uneventful as a day in Canyonlands could be. 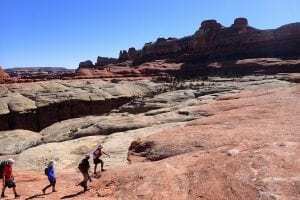 For most of the afternoon, we stayed hiking on the sandstone tops of the canyons, exposed to the forgiving March sun and the cool wind that effectively canceled it out. Towards the end of our hike, we dropped down onto the canyon floor and hiked our way to the second campsite of the trip in the center of Squaw Canyon. 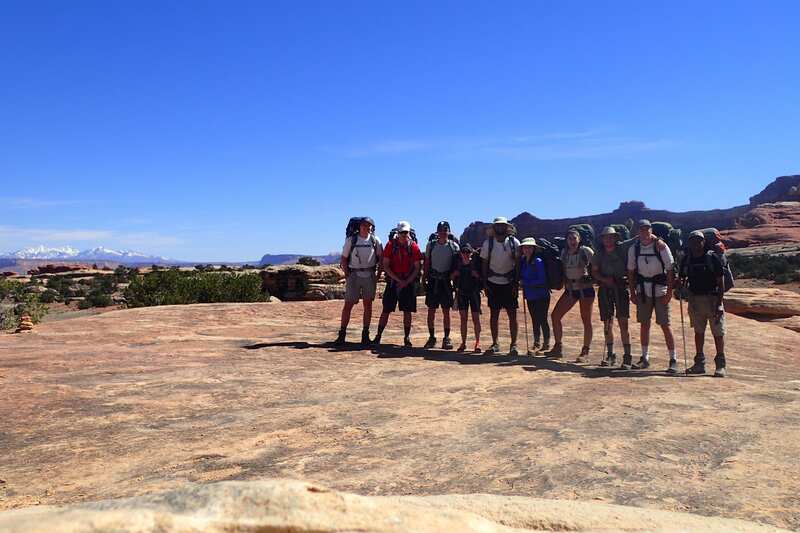 In the meantime, Albert’s group hiked into Squaw Canyon and out of it into Long Canyon in the first day of hiking. On the second day, they hiked further up Long Canyon before getting to camp. The third day was a layover day, meaning we didn’t move camp. So, we packed the essentials for our day packs and hiked to the Albert’s group that was camped about 3 miles away in Lost Canyon. It was immediately clear that Lost Canyon was ecologically and visually different than the last two canyon systems we had hiked in. The valley floor was overgrown with deciduous trees and reeds, with enough water to keep them alive until at least the next rain. We hiked along a stream that was not flowing, but it absolutely wasn’t dry. We took this opportunity to fill up on water. Soon after our water break, we met up with the other hiking group. 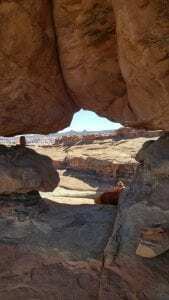 They had set up camp in a shady spot behind a large rock outcropping. We hugged, exchanged stories, and were quickly off to our day hike. We hiked about five miles towards Peekaboo Springs, a spring on the east side of the Park. Our hike took us along the roofs of the canyons. Towards the end of our hike, we discovered the reason for the name “Peekaboo”. There was a gap in one of the canyon walls, about 4 feet by 4 feet. Looking through it, we could see the hike down to the spring as well as the rest of the canyons in the park. It was not a forgettable view, to say the least. At this point, we decided to turn around and head back to camp. When we got back, we said our goodbyes and parted ways until the next day. The following day was the last day of our trek. We had plans to meet with the other group at a trail junction about a mile north of our camp and all finish the hike together. Because we only had to hike a mile, my group got there an hour and a half before the meeting time. We chose to spend this time as an extended lunch break. Finally the other group caught up to us, and we hiked the last mile out together. The only notable things from the rest of the day are the ice cream I ate and the shower the program paid $3 for, which was worth about $30 to me. The next day we packed up, put on our normal people clothes and began the 16 hour drive back to Dallas. Michael Weiss- SMU Outdoor Adventures Trip leader.